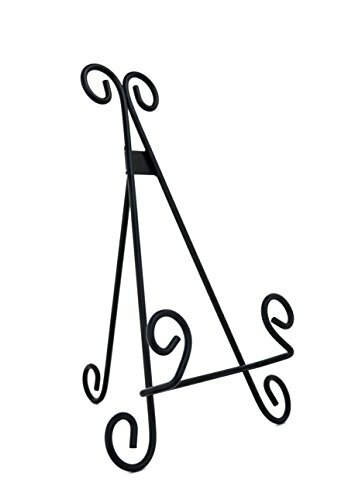 12" display stand, Built tough to withhold heavier items but designed with graceful curves to gently hold onto your precious belongings from your favorite painting to your heirloom recipe book. This decorative book stand is the perfect piece to house your favorite cookbook in your country-inspired kitchen. You can also house a delicate decorative platter in your living room; this is a versatile piece fit for any room. The sturdy iron legs are built with high quality materials to ensure durability and the best support. Premium, heavy duty black metal materials allow for an ever-lasting book stand that display any art or books in your house. Curved to resist scratch the surfaces you put the stand on. Great gift as a decorative piece for any part of the house: picture frame stand, cookbook stand, art display, even your iPads or tablets! 12" display stand with fold-able rear leg to allow you to display your item at any angle you wish. If you have any questions about this product by Maypes, contact us by completing and submitting the form below. If you are looking for a specif part number, please include it with your message.